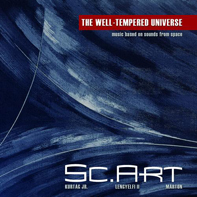 The first album of Sc.Art is based on and is inspired by sounds from Space. The audio samples were created from the billion-years old Cosmic Microwave Background. Images and sounds were recorded by NASA in Space and transformed into audible sound samples by professors in Hawaii and Iowa. Sc.Art plays on electronic instruments using the sound from the Big Bang and of the Earth’s auroral kilometric radiation caused by energy electrons striking the atmosphere. The band also uses sounds recorded by probes in the planetary environment of the Solar System. The signature elements of musical tonality are the result of Gyorgy Kurtag Jr.’s years of work as a sound designer. The sound effects of an electronic double bass, a bass guitar, and sample sounds triggered by an electronic drum create a truly unique soundscape. In this project, Sc.Art does not use readily available sounds, like those of synthesisers or drums – all sounds you’ll hear are new and unique. Partly an homage to Bachs’s The Well-Tempered Clavier, Sc.Art’s Well-Tempered Universe consists of 10 movements of timeless instrumental music. 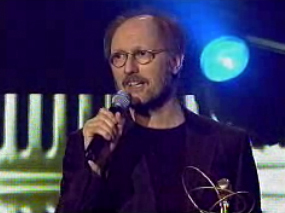 The album won the Classic Contemporary Album of the Year Award in 2010 in Hungary. 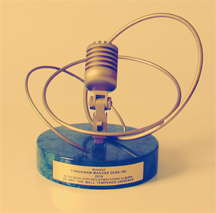 The Well-Tempered Universe won the Classic Contemporary Album of the Year Award in 2010 in Hungary. „It was an exciting task to discover musical elements in the cracks and whistles originating from the celestial bodies of the Solar System. Sometimes during rehearsals I felt as if I changed my career to a space audio archeologist. We were dividing sound samples into second-long segments. In some we heard melodies that we transcribed for the synthesizer, and used others as part of an electronic percussion sound set. We also found tones that we reproduced on our instruments.